1,FDA,SGS&CCIB certificate 2,MOQ:1200PCS 3,Sample available 4.Accept customized logo,shape,color and so on. Item No. Additional: unique style and various shape,size,decal,OEM We can make diffirent size, style, color,various shape and decal, according to client's requirements. Such as new shape,color,size,printing,packaging and so on. 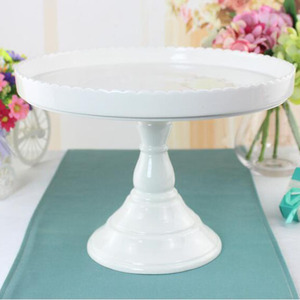 10" white fancy wedding ceramic cake stand Quality control : New Flourish promise our quality inspectors will do the inspection all according to customers standards. 3. Can you make our designs for the package 9 Yes, pls send us the designs you need , we will value the price and make the exact same package based on your designs. 4. What is your sample lead time 9 For stock ready sample, it can be sent out in the working day , for new sample, it will need 7-15 working days depending on the actual sample requirements. 3.Owning an excellent design team,we can help you to design any items that you want. 5.Owning a best sales team,feel free to talk to our customer service center about your requirement. Q1: Are your samples free or need cost9 Actually it depends on the products. (3) We can make new designs according to client&rsquo;s requirements such as new shape, material, color,size, printing and so on. 3, How many kinds of shape for this item can you make9 Round, square, oval, triangle, star shape, heart shape and so on. ), North American market, South American market, African market, Oceania market,China dinneware. 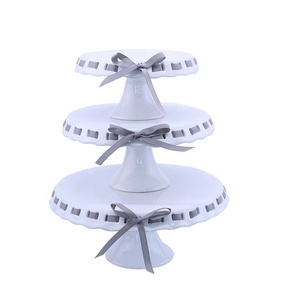 3 layer folding with knock-down metal stand ceramic party wedding cake stand Item No. 2.Quality guaranteed, all products are strictly suspected by our experienced workers. 3.Faithful manufacturer with a lot of brand named partner, we will do the best to serve you. Q4: Have you pass any factory audit9 A: Yes,we passed the Walmart audit, Target audit, Crate & Barrel and Auchan audit. Q5: Can I get some samples9 A: Free samples are available if they are ready in stock. Sampling charge is required if new mould to be developed or none ready item on hand. 2.We are professional ceramic and porcelain manufacturer in China with over 10 years experience. 4.We have strict & effective QC system, and have the strong development capacity on new products. 5.We have our own brand name BRT Ceramic but ODM & OEM orders are Product Information Item No. 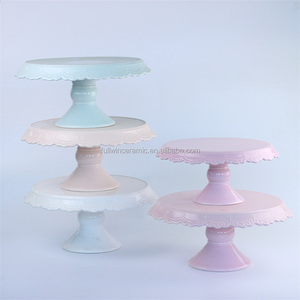 Alibaba.com offers 2,650 ceramic cake stand products. About 50% of these are cake tools, 32% are dishes & plates, and 1% are event & party supplies. 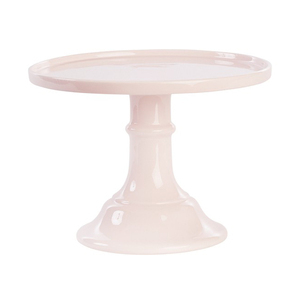 A wide variety of ceramic cake stand options are available to you, such as ce / eu, ciq, and fda. You can also choose from disposable, eco-friendly, and stocked. As well as from ceramic, metal, and plastic. 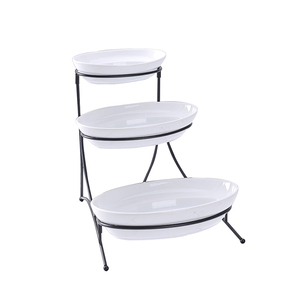 And whether ceramic cake stand is cake tools, or event & party supplies. 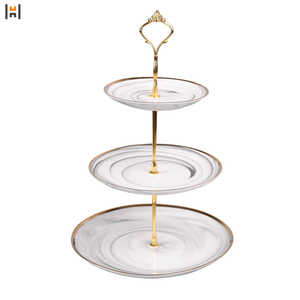 There are 2,650 ceramic cake stand suppliers, mainly located in Asia. 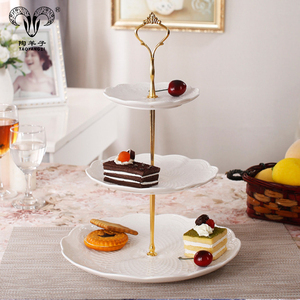 The top supplying country is China (Mainland), which supply 100% of ceramic cake stand respectively. 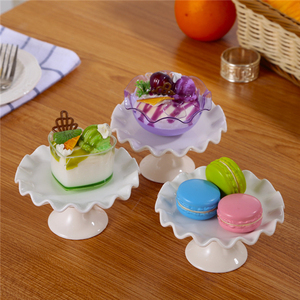 Ceramic cake stand products are most popular in North America, Western Europe, and Eastern Europe. You can ensure product safety by selecting from certified suppliers, including 696 with Other, 512 with ISO9001, and 160 with ISO14001 certification.